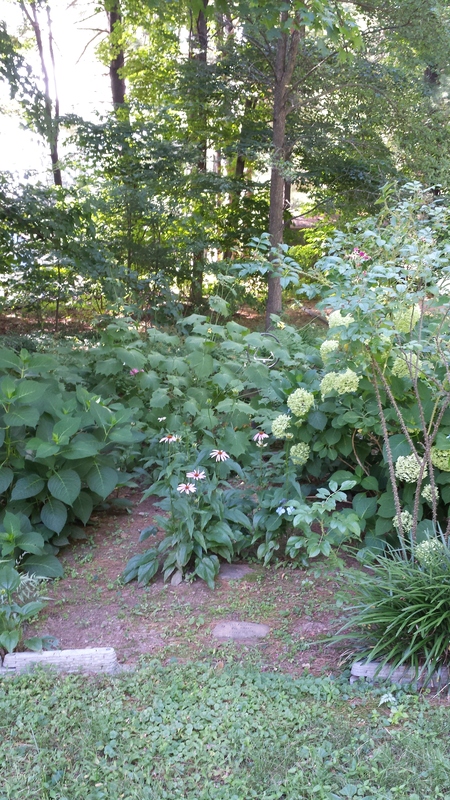 Notice the purple cone flower at the front of this garden. Pretty unremarkable, right? What if I told you they’ve actually “migrated” from the back of this garden and were originally planted at least 8 feet away? How does this happen? Even I’m not sure, particularly since they had to migrate around a large hydrangea and a hydrangea family relative that’s even bigger called yellow wax bells (kirengeshoma for those of you that like botanical names). And while it’s not uncommon for plants in this family to self sow, they would usually do so in the near vicinity–not 8 feet away and not in an area that is away from any prevailing winds we might have. This didn’t happen in one year; it has happened gradually over 2-3 years. But I still find it remarkable that a plant was able to move this distance. Why has this happened? It’s gotten shadier where it was originally growing. So the plant has literally moved itself into the sun. Invasive plants are notorious for “seeding themselves around” but perennials will rarely travel such distances. Even my natives that I consider “pests” like Virginia creeper (or worse yet, poison ivy) which have the ability to “migrate” great distances really only have that ability because of their fleshy fruits that are eaten by birds and then dropped somewhere else. So this plant has done something pretty special and I am just amazed. Previous Article Are Knockout Roses Disease and Insect Proof? Next Article Wordless Wednesday–Bad For Bees? I have found natives migrating from the far back to the front garden. I think they are carried by birds or the wind especially if birds eat the seeds. It is possible in this particular case in my garden that these plants are moved around by Goldfinch. I do see them eating the seed from both these plants and black eyed susans. I wouldn’t want to speak for everyone. But it seems to be the case that the seeds only germinate in the new, sunnier locations. I guess that was the point I was going for. And of course, that would be true for any plant, native or not–it would only thrive where it is happy. I can’t imagine true shade lovers migrating to the sun. Thanks for letting me know it’s happening to you too!